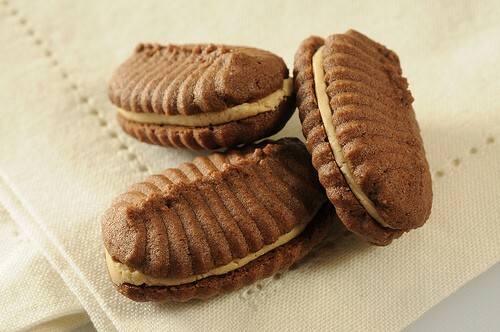 Chocolate Espresso Sandwich Cookies • a homemade coffee-flavored "oreo"
Homemade Chocolate-Espresso Sandwich Cookies are made with a cookie press and filled with espresso frosting. These are especially nice for a cookie tray assortment of cookies like you might give away around the holidays. As a kid in 4-H, I spent an inordinate amount of time trying to make 5-6 cookies that were perfectly round and exactly the same size for my entry at the county fair each year. If only I had used a cookie press, surely I would have won the grand prize. 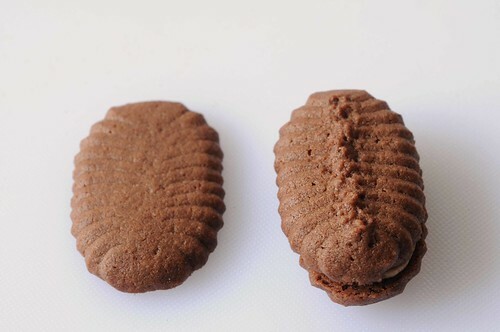 One of the biggest advantages of a cookie press is the ability to make cookies the same size with consistency. Especially important for gift giving or cookie platters at Christmas. And 4-H competitions. I love the chocolate and coffee flavors in these oreo-like cookies. Perhaps I should enter them in the Texas State Fair now that I know the secret to making perfectly uniform cookies. 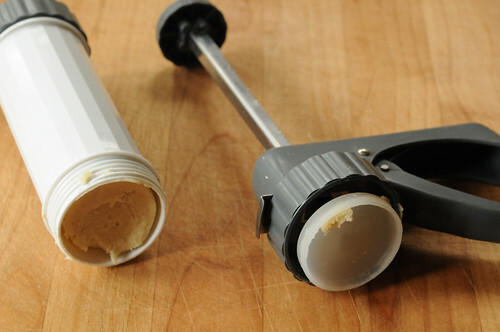 Another advantage to using a cookie press is the way it can spit out cookies faster than you can push dough off a spoon. With a little practice, you can fill a tray in no time at all. I know, I know. This is one more gadget to add to your crazy-full-already kitchen cabinets. But they don’t take much more room than a bag full of cookie cutters. Seeing that cookie presses are inexpensive and available most anyplace that sells kitchen gadgets, I think you would enjoy having one. Because these are sandwich cookies, I use my finger, slightly dampened to flatten the middle of half of the cookies so they will lay flat when turned upside down. Do this after you have pressed the cookies out on a cookie sheet. You’ll see why when you start to assemble cookies. 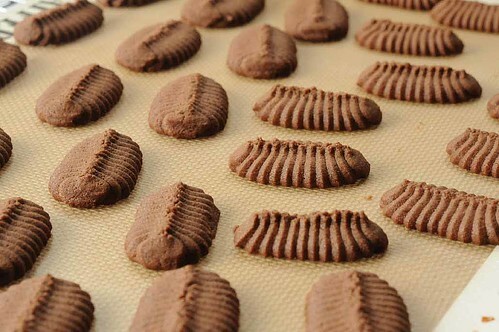 Pipe cream in teaspoon size blobs onto the bottom of the cookie halves you flattened in the fifth step of the recipe. 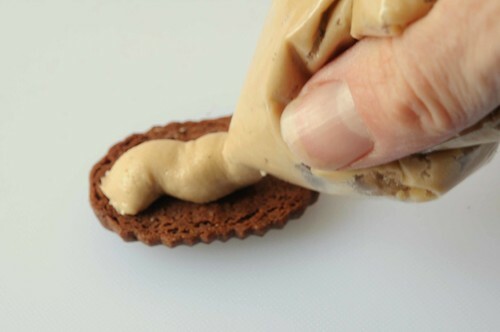 Place a cookie with a ridge on top of the cream filling. I took these to a cookie exchange party yesterday. They have a different shape than any other cookie on the table. The chocolate and coffee flavors in these Homemade Chocolate-Espresso Sandwich Cookies is one of my favorite flavor combinations. Perhaps I should enter them in the Texas State Fair, now that I know the secret to making perfectly uniform cookies. Combine butter and shortening, mixing well. Gradually beat in the sugar, espresso, and vanilla extract. Beat on high 2-3 minutes until light and fluffy. Blend butter and cream cheese . Add sugar and beat thoroughly until light and fluffy. Add egg, then melted chocolate. Blend well. Measure flour into sifter or sieve along with baking powder, espresso powder and cocoa powder. Sift together. Note: Cocoa and espresso powder are optional but I think it intensifies the chocolate flavor in a good way so I highly recommend them. Add dry ingredients to cream cheese mixture; mix thoroughly. Heat oven to 375 degrees F. Force dough through cookie press onto ungreased baking sheet using template of choice. Practice a few times until you get the hang of it. Return ugly cookies to cookie press and try again. Pictured below is the template I used for these cookies. Wow, I just noticed I didn't dry it very well. Amazing what you can see with a macro lens. Because these are sandwich cookies, I use my finger, slightly dampened to flatten the middle of half of the cookies so they will lay flat when turned upside down. Do this after you have pressed the cookies out on a cookie sheet. You'll see why when you start to assemble cookies. Note: If cookies won't stick to tray when you squeeze the gun, the dough may be too warm--chill a bit. If dough is too cold, it will crumble. Cookie sheet should be cool--not warm out of the oven. Cookie sheet or silicone liner must not be greasy. Bake 10-12 minutes or until slightly browned. Cool. Fill pastry bag or zippered plastic bag (my preference) with filling. Use 1/2 inch round or star tip or snip corner of plastic bag. Make sandwich by topping with another cookie that was not flattened and press lightly to squash the filling evenly to the edges. If cookies won't stick to tray when you squeeze the gun, the dough may be too warm--chill a bit. If dough is too cold, it will crumble. Cookie sheet should be cool--not warm out of the oven. Cookie sheet or silicone liner must not be greasy. Thanks, Paula! Can’t wait to try them. Amanda, Approximately 2 1/2 dozen. I found this recipe while doing a web search and they look delicious! I was wondering how many sandwich cookies the recipe makes? I can’t seem to find that information on there. Thanks! I just had a party with a whole spread of goodies I’d been making and totally forgot to take a picture of the table. Sigh. Life goes on and love the look of your spritz cookies, they look great! I’m getting that cookie press out now. Chocolate and espresso are such a fantastic combination. 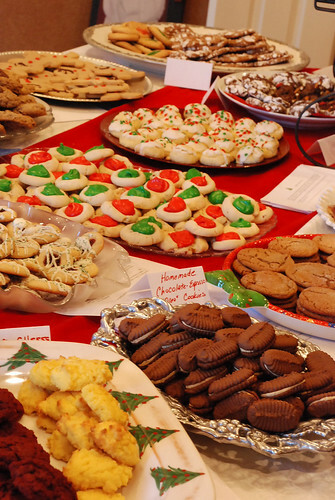 The cookies are beautiful and sound delicious! 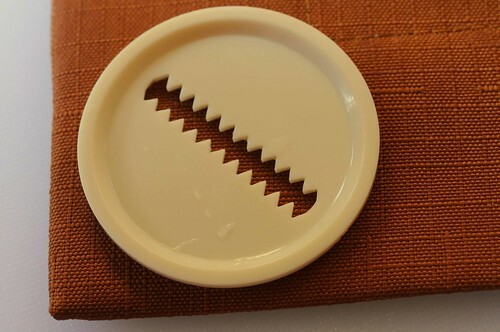 My grandma used to use a cookie press and I’ve been tempted to get one and give it a try. Oh Romaine, they are wonderful! Very impressive 🙂 Espresso is one of my favorite flavors too! Romaine, those are the nicest cookies on the exchange table! How on earth did you get that wonderful oval shaped spritz from that disc??? I’d love to do the same shape – do you use a special technique? Just a few baking days let, but I’ve yet to use the cookie press, and this recipe moves to to the top – especially if it contains espresso!